Adventure Game Studio | Forums | Top-down 'JRPG-style' environment art, with a twist... pointers appreciated! Topic: Top-down 'JRPG-style' environment art, with a twist... pointers appreciated! Top-down 'JRPG-style' environment art, with a twist... pointers appreciated! 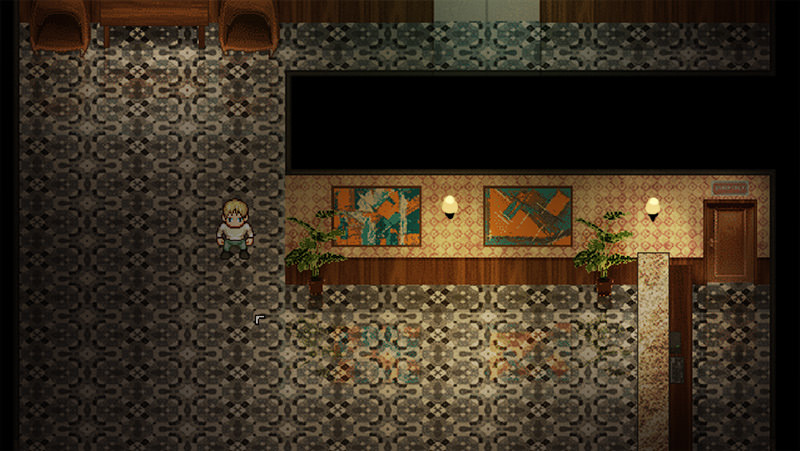 The game I'm working on, Reality Falls, uses the same sort of top-down, JRPG-esque art style as my previous game, Richard & Alice. I'm conscious that the art was a very weak aspect of R&A and keen to improve it, but at the same time I'm keen to keep it as a solo project for the time being, meaning I'm not in a position to outsource the art to - y'know - an actual artist. This time, I'm trying something slightly different: the same top-down false-perspective, but making heavy use of modified textures adapted from real-world photographs. I'm taking textures of - say - carpets, walls, whatever, resizing them to be nice and small, then reducing the number of colours to give them a pixel art feel and help them to sit together in the world. I'm content that this is the art style and approach I want to go for, but I would definitely love some thoughts from people who are a little more artistically minded. Within the scope of this style and process, what sorts of things should I be looking at improving, based on the below screenshots? Anything from image composition to colour palette to the little details I as a very-much-not-artist might not even consider when putting a scene together? Re: Top-down 'JRPG-style' environment art, with a twist... pointers appreciated! The only thing that jumps out at me is the perspective of the textures, mostly on the floors. It's most noticeable on the last shot, where it makes the perspective seem off. It needs to be shrunken slightly horizontally so that it fits with the perspective for the room. It's a bit noticeable on the obelisk too. Thanks for the tips! How does this look? I've changed the aspect ratio of the floor texture, plus added some subtle reflections to suggest a polished floor surface. What bothers me most is the difference in treatment between the chibi character and his realistic portrait. I have trouble linking them. Isn't that the portrait of the guy the main character is talking to with the grey hair? I will, however, almost certainly have the portraits replaced in the final version. So don't worry about those for now. Mainly the environments I'm looking at right now. Cheers! I think the textures work quite well and give a unique style but I agree about the portrait looking way off. The backgrounds feel a bit flat to me. They lack contrast, and that can make it hard to distinguish between the floor and the walls. Take picture number 3 (the pub), for example. It's all in the same reddish/brownish colours. It's very noticeable if you look at the bar and floor, which almost blend together. Also, the interior rooms feel too empty. I would expect to see some tables in the bar, some balls on the pool table, and more furniture in the corridor (picture 6). Right now, they don't look like "inhabited" places. I've made the floor lighter, to help differentiate it from the bar, and added some light and shadows to give the image some depth. Hey Lewis! Nice to see that you're making another game! I think that the style works well in general, but the 1st screenshot feels like the best one by far to me. The obvious reason for that is that it has strong dramatic lighting and simple, punchy colour palette. So that would be my advice - add clear light sources to the scenes, and use similar soft lighting, breaking up the backgrounds into areas of shadow and areas of light. Lorenzo's lovely edit of the bar also introduces something similar, and his points about differentiating the vertical and the horizontal planes a bit more are also very much worth listening to. You guys are totally right, the richness of lighting makes a HUGE amount of difference. 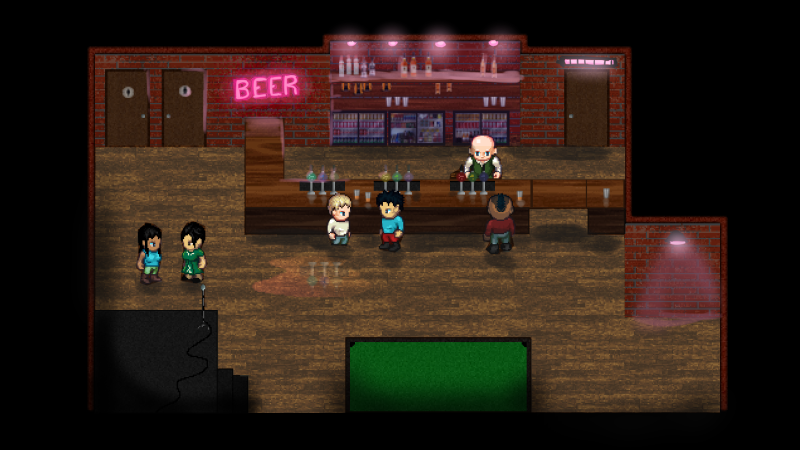 Here's something I've been working on for the bar scene. Still needs a bit of TLC but I reckon it's already shaping up to so much better. @Ilyich - LOVE the hotel foyer treatment! The mood of the scene wants to be slightly colder than this but it definitely gives me a very strong idea of where to go with it. Thanks so much!